Las Vegas is at the heart of the hottest, harshest desert in North America, and so receives less than four inches of rain (10cm) per year. The last day of June 2013 wasn’t just hot. It was as hot as it gets in Las Vegas. The valley tied the official record of 117 degrees on Sunday, matching the record set on July 24, 1942, and July 19, 2005. It was the hottest day for the month of June at Mc­Carran International Airport, the National Weather Service’s official monitoring station. It was also the warmest June on record; 2013’s average temperature of 91.5 broke the old record of 90.5 set in 2006. When you come to Vegas during the summer, do not leave any type of aerosol can in a vehicle, especially in direct sunlight. Other items, such as video tapes or CDs/DVDs can be damaged. Small electronic equipment such as cell phones, cameras, DVD players and IPods can be damaged because of the heat, which can reach as high as 160 degrees in a vehicle. Never leave children or pets in a parked car: The temperature can rise to 135 degrees in less than 10 minutes, which can cause death to children or pets. If you see a child or pet unattended in a parked car, you should call 9-1-1 and alert authorities. Make sure to drink plenty of fluids: The replacement of fluids during the summer is essential for good health. Water is usually the best fluid. Fruit drinks are also good if used in moderation with water. Temperatures vary enormously, with daytime maximums averaging over 100°F in July and August, and night-time minimums dropping below freezing in December and January. 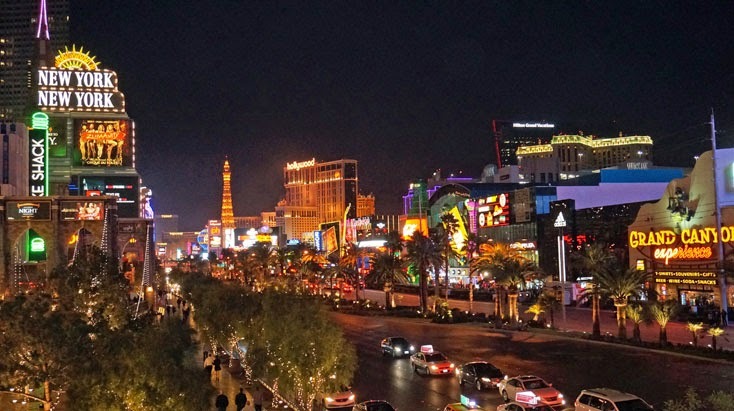 The ideal months to visit Vegas are April, May, September and October. The city is at its quietest, and room rates are therefore lowest, during the first few weeks of December and the last few weeks of January, and also during June, while July, Christmas and New Year are the busiest periods of all.